Location: Aubenas, in the Ardèche departement of France (Rhone-Alpes Region). 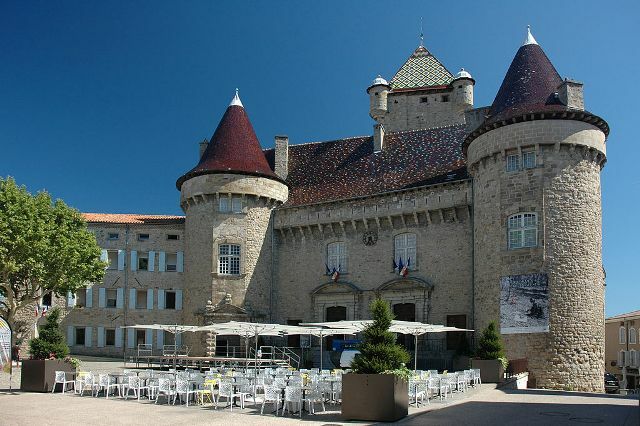 Notes: Figure of the Ardèche civil architecture, the Château d, also called castle of Montlaur is located in the town of Aubenas in the Ardeche department in Auvergne-Rhône-Alpes region. This "building in metamorphoses" bears the mark of six noble families who lived from the twelfth century until the Revolution. It is the subject of a classification as historical monuments since March 2, 1943.The twelfth century to the Revolution, six noble families succeed. Montlaur family will reign from 1084 to 1441, and built the dungeon, the city wall and the two round towers of the castle, then ditched. The castle will then pass into the hands of Maubec until 1551, followed by the Modena Ornano until 1665, of Harcourt-Lorraine who then bequeathed in 1716 to Vogue, who keep until 1792. The building became property of the city of Aubenas in 1810.